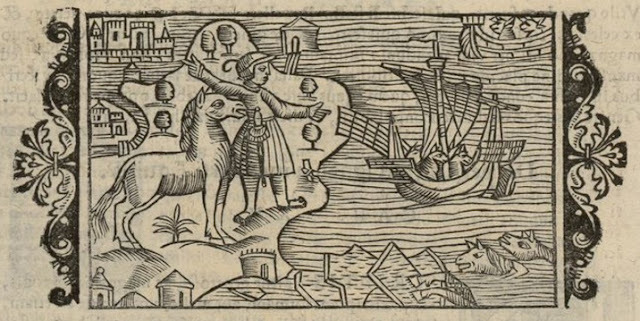 Where are you going little ship full of wolves? Olaus Magnus' 1539 map of Scandinavia, the Baltic Sea, and the North Atlantic, entitled the Carta Marina is a milestone of European cartography. At the time, it was by far the most accurate map of the region that had ever been made. Along with the correct geographic details and placements of human settlements, Magnus covered the map with hundreds of drawings of human history, ethnography, and natural history. Sixteen years later, he published a book expanding on those topics, entitled Historia de gentibus septentrionalibus (History of the Northern Peoples). For the book, he prepared 481 woodcut illustrations (including some duplicates). Of the illustrations, 124 are adapted directly from the map while many others include elements from the map. Unfortunately, many interesting illustrations from the map didn't make it into the book. We have no way of knowing what they indicate. Other illustrations, prepared for the book, don't always match the text of the chapters they've been paired with. I'm working on a couple of blog posts about strong women in the Historia. While I do that, let me share some of my favorite illustrations. Before I offer the first illustration, let me make my excuses. Although he was Swedish, Magnus wrote his book in Latin. At the time, there weren't even that many Swedes who wrote and read Swedish, and he was a Catholic priest. I can bludgeon my way through Latin well enough to get the gist of a text, but I'm not going to spend a whole afternoon to get a clean literary translation for the caption to a picture only a few dozen people are going to look at (unless I really like the picture). Next, the good commentary on his illustrations appears to be primarily A) in Swedish and B) not online. I might be horribly wrong in my interpretations of the illustrations. I hope that makes them more fun to look at. They are sailing eastward across the Baltic south of the island of Gotland and parallel to an ice-bound Polish coast. I believe the indication of ice-bound waters was an innovation of this map. Their eagerly anticipated goal appears to be in the neighborhood of Memel, Prussia, now in Lithuania. But, are they wolves? I checked all of the illustrations in the Historia looking for boats in the Baltic Sea, both for this story and another. I found another illustration, set farther north in the Baltic Sea, that is intriguing, puzzling, and tragic all at once. The title of the chapter is "About horses of Sveica and Gothica, why they are preferred to others, and exported." The illustration shows a barefoot man on the shore. Next to him is a large horse. He holds one arm up, with the forefinger extended above the horse. 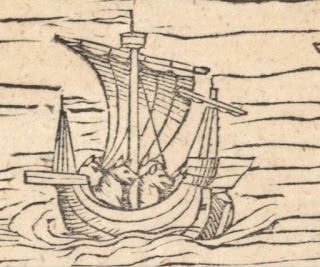 The other arm is extended downward at a tied-up ship full of animals (they resemble my wolves, but are they horses?) who look away from him. 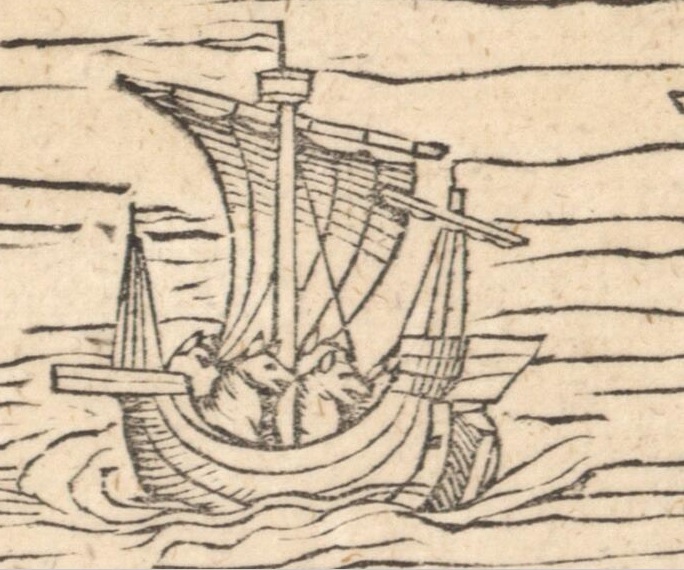 Another boat is still at sea in the upper right corner filled with animals that have ears and horns (goats? How many animals are sailing around the Baltic? This question will come up later). The bottom right quarter is filled with a disturbing vignette of two or three horses at sea, trying to climb onto icefloes. The chapter explains that the horses Sveica and Gothica [the core provinces of Sweden] are in demand for export, but that there is a royal edict against selling warhorses. Do the horse, the man, and the boat full of animals represent an honest trader dividing superior war-quality horses from shamed exportable horses? This is followed by a lot of text demonstrating how much they love their horses, including a poem. He then mentions the lively horses of the island of Oelandiæ (Elandia on the map, Öland in modern Sweden). He says they are lively and ready for action and then something about dancing dogs that I haven't properly translated. In this case, are we looking at a well trained troop of performing animals? The dog/wolves are looking away because they are waiting for their cue. This is not as crazy as it sounds. There will be other animals on boats. So, who are the sly animals on the boat? Note: Online you can find many images taken from the less detailed second edition of the Carta Marina. There are only two copies of the first edition that have survived. This is the map I'm using for all my posts. The book, the Historia, was translated and reprinted many times. For my images and my text, I'm using the first, Latin edition from this site. If you write about this, please link and credit carefully.